The 3D graffiti project has been initiated jointly by IDEA Public Union and YARAT Contemporary Art Space in September 2014. 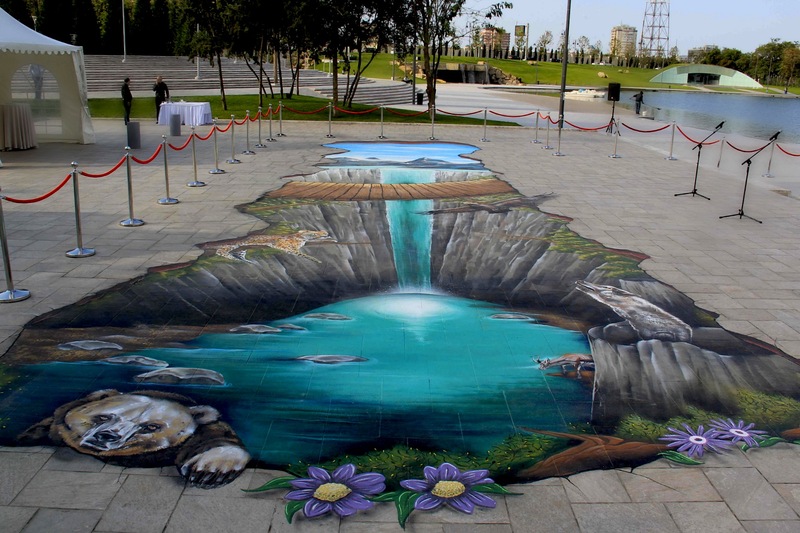 The project included painting of a picture with 3D effects on the ground with specific environmental messages. The Graffiti work illustrates the Big Five animals of the Caucasus, that were determined at the initiative of Vice-President of Heydar Aliyev Foundation, IDEA Founder Mrs. Leyla Aliyeva, as well as importance of the protection of those animals. “The Big Five” project includes conservation of animals such as wolf, bear, eagle, the Caucasian leopard and gazelle that inhabited in the area of Azerbaijan, and faced with the danger of being endangered. The work, which was created by English artists – Edward Shearon, James Titchner, Julian Phethean within 5 days, aims at raising awareness of environmental problems, and drawing attention towards these problems throughout art.